1. How did you become Retch, the lovable assistant to mad scientist and “ghost host with the most” Professor Morte? Being a horror host has been a lifelong dream of Shane’s. We’re really close friends and fellow performers, so when he approached me, told me about his idea for the Spookshow and asked me to be his sidekick, I simply said “yes.” He really had no specific character idea for Retch. He and I brainstormed for names and that one stuck. 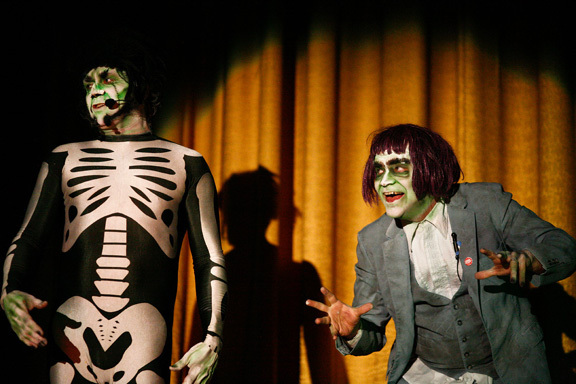 When it came to wardrobe, I suggested an old Halloween costume Shane had made based on the hitchhiking ghosts from Disney’s Haunted Mansion attraction. He had it tucked away in storage, so he dug that out. For some odd reason I thought the character was in need of a bobbed hairstyle. Don’t ask me why. Shane and I stumbled across a purple wig in the Halloween section of the local Kroger. Shane then worked his make-up magic and came up with Retch’s look. It was up to me to actually come up with the character. Shane kindly gave me carte blanche, which was great. I basically based Retch on all of the comedic sissies I grew up loving. He’s got a bit of Bert Lahr’s Cowardly Lion from THE WIZARD OF OZ, a dash of Joe Besser from the Three Stooges, and sprinkles of Charles Nelson Reilly, Rip Taylor and Paul Lynde. Something about those effeminate comics really tickles me. And the voice obviously owes more than a little to Bullwinkle J. Moose. 2. 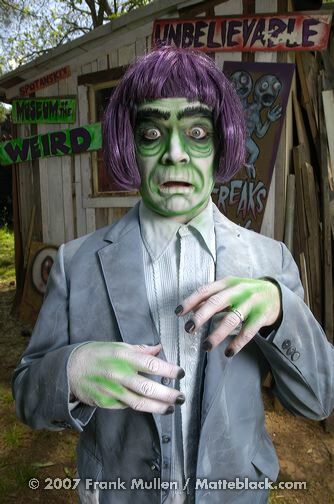 Shane has hinted on Facebook that the FRANKENSTEIN Spookshow will be heavy on props. The show has had some amazing ones for its budget from black-light monsters to well, a life-sized Godzilla suit. Without giving away any big spoilers, can you share a hint of what audiences can expect? Well, you never know what Morte is going to spring out of his lab at the last minute. And I’m being serious. Sometimes we have no idea what the props are until Shane loads them into the Plaza hours before the show. I do in fact know this show features some hilariously hokey gags in true Spookshow fashion. 3. When/where did you first see James Whale’s FRANKENSTEIN, how old were you and what impact did it have on you? I’d say I was 6 or 7. TBS, which was known as WTCG at that time, used to do a Friday Night Frights show when they’d air classic monster movies. That had to be the first time I saw it. I was really touched by the monster’s innocence, something I could relate to at a young age. I saw YOUNG FRANKENSTEIN shortly thereafter, which had a huge impact on me in a comedic sense. And the [FRANKENSTEIN: THE TRUE STORY] TV miniseries in the mid- to late ‘70s really did a number on me, too. Because of all that, I’d say Frankenstein is probably my favorite of the Universal Monsters. The original FRANKENSTEIN was our first Spookshow film, and I can’t wait to see again on the big screen, this time with my own kids. 4. It’s hard to imagine the Spookshow being anywhere but at The Plaza Theatre, and the Plaza seems more than a stage but an actual character. [Editors’ Note: The Plaza opened Dec. 1939 with George Cukor’s THE WOMEN and it’s supposedly haunted!] Can you talk a little about why that is and what makes the Plaza so special? The Spookshow is fueled by classic cinema, and the Plaza embodies that. It’s the perfect backdrop for the Spookshow, bar none. From the flowing screen curtains to the rocking seats to the light fixtures, the Plaza is simply a thing of beauty. With its Andy Hardy-like aesthetic and hey-let’s-put-on-a-show spirit, the Spookshow is the epitome of independent entertainment. What better place to perform than Atlanta’s longest continually operating independent movie house? 5. What’s your favorite part of playing Retch and/or do you have a favorite scene/show over the years? My favorite part about playing Retch is the improvisational aspect. There’s an outline, but no script. So most of the lines come up on the spot. And riffing with Shane as Morte is an absolute blast. After four years of working on stage together, we’ve got wonderful chemistry and a bit of a rhythm going. That’s the most fun. Since we all do the Spookshow in our spare time, things usually come together at the last minute, which can be frustrating and stressful. But once we get on stage and get going, it really feels magical, pardon the cliche. As far as favorite scenes go, I’d have to say Retch’s wig mishaps have been the funniest. Once during the middle of a show, I took my wig off in between scenes and tossed it backstage. When it came time to put it back on, I grabbed a wig off of the floor. It wound up being the wrong wig and I had no idea. So when I came back onstage, everyone lost it. That was pretty hilarious. And once my wig fell off completely during a show and the place went crazy, because my head is as bald as a baby’s bottom. It was really hard to stop laughing. 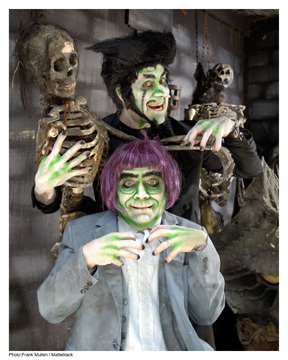 My all-time favorite shows have to be KING KONG and the HERCULES AND THE HAUNTED WORLD show we did a few months back. All of our cylinders were firing during those shows. That was the Spookshow at its best. 6. Switching gears to your other personas, as emcee for Blast-Off Burlesque, you always seem to step effortlessly into the perfect character for each show’s theme, but I thought you really outdid yourself as Rip Taylor at the HOLIDAZED AND CONFUSED show a few weeks ago. Why Rip Taylor and did you use “method acting” or “Shakespearean training” to prep for the role? That was actually Barb Hays’ idea. Each time Blast-Off does a show, she and I decide what character I should do. Rip’s confetti-throwing glee really fit into HOLIDAZED AND CONFUSED. She asked if I could pull it off, and I gladly accepted. I’ve been doing celebrity impersonations since I was 5 or so. So I love the challenge of stepping into a character. I’m a big fan of Rip’s, and he’s actually a friend of mine. We’ve worked together in the past. In fact, my wife and I spent my 40th birthday in L.A. last year having dinner with Rip at Musso & Frank. It was awesome. So I’m lucky enough to draw from personal experience. That and all of the countless hours watching SIGMUND & THE SEA MONSTERS, THE $1.98 BEAUTY SHOW and THE GONG SHOW as a kid. 7. Van Heineken, your Van Halen tribute band, hasn’t seemed to be playing around town as much lately. Will we see more shows in 2011, and maybe even a recording? Outside of a promotional demo, I don’t think we’ll ever make a recording. I always think it’s weird when a tribute band makes a record. What not just listen to the real deal? And Van Halen will hopefully have its first full-length album with Roth on the mike in 28 years done by summer. The trouble with Van Heineken is that I’m so busy as a freelance writer for the Atlanta Journal-Constitution, doing my radio show and raising three kids with my awesome wife that I don’t have time to book the band. We do shows when we can. Usually when we’re asked. I expect some shows in 2011. Just can’t tell you when. 8. Sure, there’s oldies radio, but THE POP CULTURE KING SHOW on Atlanta’s AM 1690 The Voice of the Arts (WMLB), embodies the same spirit as ATLRetro on the air better than anything else I’ve heard locally. I love the way you spotlight current movies and other media but also pay homage to their roots with music and other clips. What’s your favorite show you’ve done and what’s in the works? That’s a tough one. I had a blast putting together the Kiss show that ran back in the late summer. I interviewed both Gene Simmons and Paul Stanley, which was killer. Since I produce the show myself, I had the opportunity to throw in some really wacky audio clips like the Mego Kiss toy commercial from the ‘70s and an excerpt from Kiss’ appearance on THE PAUL LYNDE HALLOWEEN SPECIAL. And when I get the opportunity to interview entertainment icons from my childhood, it’s hard not to get giddy. Some of my favorites have been Julie Andrews, Anthony “C-3PO” Daniels, Cheech & Chong, Dan Aykroyd and Adam West. All of those folks have a special place in my heart, and it was an honor to have them on the show. When Anthony Daniels did a show promo in the C-3PO voice, I almost wet my britches. I’m in the process of working on some more dream guests. After seeing Carrie Fisher’s one-woman show, I’m dying to have her on the air. Karl Slover with Blast-Off Burlesque & other Plaza friends. 9. You’re truly a Retro Renaissance man. Anything else new in the works that ATLRetro would love? Thanks, that’s quite the compliment! Right now I’m working on a children’s book about the life of actor Karl Slover, one of the Munchkins from THE WIZARD OF OZ. My two sons were born with dwarfism, so Karl’s story hits close to home. His parents sold him to a dwarf circus when he was 9. His job, among other things, was to ride a turkey. Soon thereafter he was off to Hollywood rubbing elbows with the likes of Charlie Chaplin and Lon Chaney, Sr. Then he appeared in the greatest movie of all time. Oodles of adventures followed. 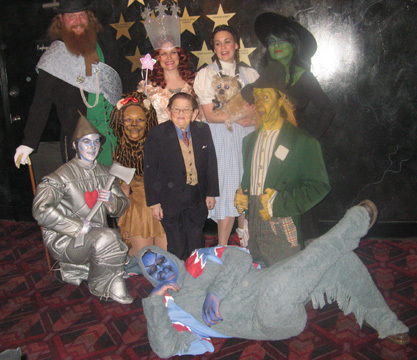 I actually met Karl last year and brought him to Atlanta to appear at a special OZ screening at the Plaza Theatre. We’ve become friends and he’s granted me exclusive access. So I’m really stoked about this book. My wife Andrea is doing the illustrations. It’s going to be a blast. Executive producer/writer of short films, BASICALLY FRIGHTENED starring Col. Bruce Hampton, which screened at the 1999 Cannes Film Festival, and BLOOD SUCKING FIEND starring SOUTH PARK alumni Dian Bachar. Brad, thanks for being the first person to comment on an ATLRetro post. Glad you liked it! Jon is indeed awesome. Very nice piece on The PCK. Sorry we missed Holidazed and Confused; I’m crushed that I didn’t get to see JW’s Rip Taylor. Our family is soooo looking forward to SSSS tomorrow, January 29 at The Plaza!